USC took down No. 17 Utah, 84-80. No. 11 Stanford upended No. 7 Oregon State, 61-44. Maryland and UConn will play a two-year series. How Bradley is transforming themselves. Marquette is on a mission to make this season a special one. Gonzaga brings a balanced approach into their game against Portland tomorrow. Tomorrow’s Arizona State at Washington game has been canceled due to heavy snow in Seattle. Megan Gustafson is dominating at Iowa. Oregon’s Satou Sabally is emerging as a big star. The humble heart of Utah’s Erika Bean. How Mississippi State’s Vic Scheafer almost quit coaching to pursue a passion. Cheryl Reeve interviews for the first time since Maya Moore announced her decision not to play this year. 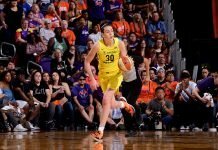 The Seattle Storm must figure out what to do with Ramu Tokashiki.